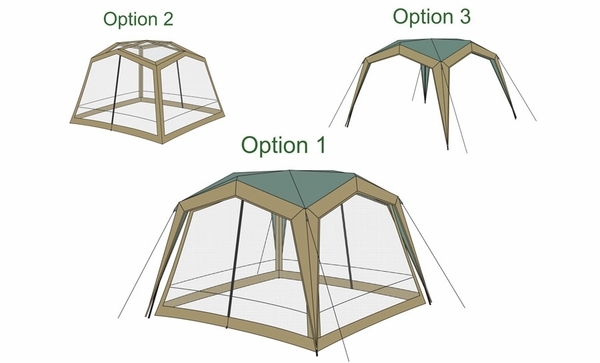 This versatile shelter has three configurations so that you can tailor its use to your particular needs. It comes with a free-standing canopy and a free-standing screened gazebo that can be used either separately or attached together. Assembly is quick and easy, and the large interior can accommodate several chairs or a picnic table if you want to keep the bugs off of your picnic lunch. Access is convenient with two large doors. The package comes with a duffel-style carrying bag, a stake bag, a pole bag, extra stakes, and guy lines for securing during windy conditions. Floor Area: 144 sq. ft. Pack Size: 32" x 11"
Can this be put up by one person? Yes, although it will be easier with a second person. It would be a good idea to view this and see for yourself if you feel you could set it up alone. For complete assembly insturctions, please view the manual.